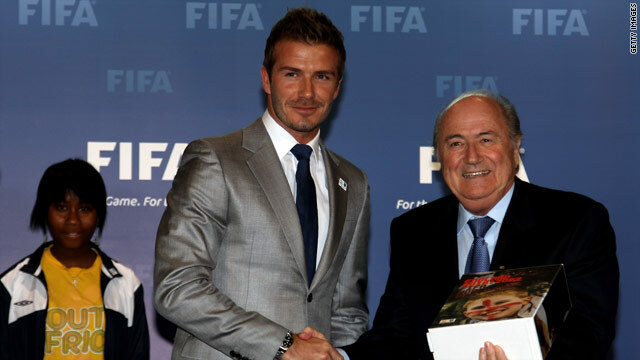 David Beckham hands over the official England bidding book to FIFA president Sepp Blatter. (CNN) -- Countries hoping to host the 2018 and 2022 World Cups formally launched their bids in a series of presentations at FIFA's headquarters in Zurich on Friday. A glittering array of footballing and sporting talent is lined up behind the nine bidders, who were presenting the world governing body with their detailed plans. Australia, Belgium and the Netherlands, England, Russia, Spain and Portugal, and the USA have submitted bids to host the 2018 and/or 2022 World Cups. Japan, Korea Republic and Qatar have restricted their bids to hosting the 2022 competition. Qatar's World Cup bid; a mirage in the desert ? In recent years, FIFA has sought to rotate the staging of the World Cup around continents, with the 2010 finals in South Africa and 2014 going to Brazil. It is widely believed that the finals will return to Europe in 2018 before going to the Asia region, which includes the Middle East, in 2022. England, who last hosted the World Cup in 1966, are among the favorites to win the race for 2018 and football icon David Beckham handed over their bid book to FIFA president Sepp Blatter. Beckham, who was a key figure in Britain's successful bid for the 2012 Olympics, said his country's love of football would be key. "We have a lot of passion for the game and passion for bringing the biggest sporting event to the country," said the former England captain. Beckham, who was set to make his fourth appearance in the finals in South Africa until being sidelined by an Achilles injury, warmed to his theme. "This is something that runs throughout our country, our veins, it's something that we were brought up with," he added. Blatter revealed that he had received a call from new British Prime Minister David Cameron, expressing his support for the England bid. The joint Dutch and Belgium bid are making the environment a key theme in their arguments. Their bidding committee led by Dutch football legends Ruud Gullit, Johann Cruyff and former Belgian international Paul van Himst cycled into the lobby of FIFA headquarters to unveil to underline their message. "We try to give two million bikes to all the fans, so they can go everywhere," said Gullit. The other joint bid comes from Spain and Portugal, hoping FIFA adopts the approach that saw Japan and South Korea successfully host the 2002 World Cup. The final choice will be made by FIFA's 24-strong ruling executive committee, which will vote for the host countries on December 2.